A mentor of mine told me that your decisions determine your destiny. 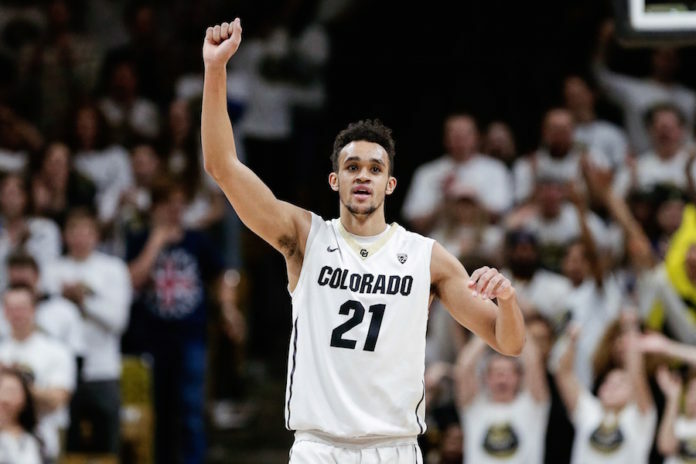 As Derrick White’s college career has concluded and he transitions towards being an NBA basketball player, parents, coaches, and supporters need to understand that the decisions made by Derrick and his parents are what led him to his NBA destiny. Over the years I’d train Derrick from time to time (Derrick trained most often with Marcus Mason of Nothing But Net) and even in high school, I didn’t see it. As a high school freshman and sophomore, I saw a lanky 6-foot-2 kid that was all arms and legs with a huge afro. Derrick was a great kid and a hard worker. I assumed he could be a small college prospect, but All-Pac-12? No way. And if you would have told me Derrick would be an NBA draft pick I’d probably laugh in your face. Despite his height and length, Derrick lacked the athleticism needed to be an elite basketball player; he struggled to move. When he’d run and even jump he didn’t bend his legs much, so he was off balance and struggled to make explosive plays. I was not alone in missing Derrick’s destiny as a basketball player. “When we were playing Gold Crown, Derrick did not even make the gold team. He turned himself into a great player with his determination and a lot of hard work,” close friend and cross-town rival Cory Calvert said of White. So how did Derrick go from being a clumsy, gangly kid to a pro basketball prospect? He grew, developed lower body strength and nurtured his athleticism. Along with the physical development, there were a handful of calculated, significant decisions by both White and his parents. Derrick’s love for basketball is pure. He loves the game of basketball more than the fame of basketball. He’s a rare breed in a generation of players that love the social media footprint, mix-tapes and overall popularity that comes along with hooping more than actually hooping. Derrick, along with his parents have taken a different approach. Derrick’s parents were never the type to brag about how their kid is rated as one of the top 9-year-olds in the country. Derrick’s parents were simply committed to aiding Derrick into reaching his potential as a basketball player and assuring that no matter how good a basketball player he was, he’d always have great character off the court that would supersede his basketball talent. Derrick’s story is an uncommon story of endurance. I believe that everyone’s path to success is tailor-made just for them. We’ve all heard of taken the path less traveled, but the White’s embarked on a path that’s never been traveled. His unique path included: Not making the top team in eighth grade, being the eighth man on his high school summer traveling team, and only playing ten to fifteen minutes per game, losing conference seasons early in his high school career. (Derrick and his parents chose to attend Legend High School, which was a brand new high school Derrick’s freshman year.) Not being deemed a division one prospect at the conclusion of his senior and once he arrived at (D-II) University of Colorado-Colorado Springs he was expected to redshirt. Derrick’s present-day success has been well documented, first-team All-Pac-12 in just one season as a Division I player, and now a potential first round draft pick. What’s not been publicized is how in the heck was D White able to go from the kid that was the eighth man on his summer team to an NBA player. With the support of Derrick and his family, we believe that young athletes along with their parents, coaches and support system needs to hear the how. 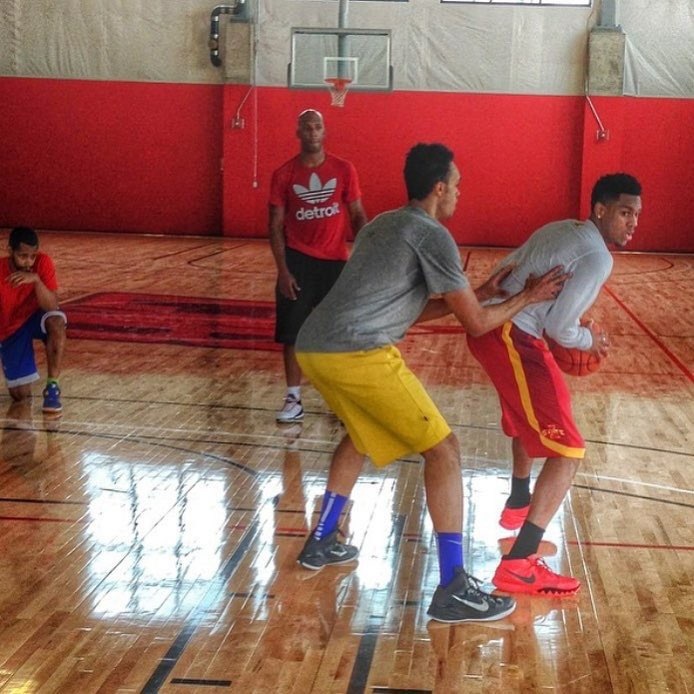 Derrick guards fellow NBA prospect Monte Morris of Iowa St. during summer workouts with Chauncey Billups two years ago. During Derrick’s developmental years his parents did not spend money sending Derrick to exposure camps all across the country, or greasing the palms of the top summer teams in the area. Instead, they stayed the course – even when Derrick was not good enough to make the top Gold Crown team. Instead of blaming the coach when Derrick did not make the team, his parents simply encouraged Derrick to work harder. The first thing I’d suggest is to get your kids with people that have a background of developing players at a high level. Once you have identified those people, stay the course and let them do their job. Their job is not to tell you what you want to hear, but what you need to hear which is what needs to be done to give your child the best opportunity to reach their potential. Many parents want it right away and when they don’t get it right away they choose to complain or leave. We told Derrick to take the 10 minutes he was getting a game and play as hard as he could in those minutes, don’t complain and always be a good teammate. Derrick began to play well and he earned more time. My suggestion to parents in similar situations is to understand that you as a parent can’t script your child’s career. You have to adapt to whatever happens and support them to overcome adverse situations. To say Derrick White, pictured here as a freshman at Legend High School, was a late bloomer would be an understatement. Richard White credits his son’s tenure at Legend High School as the reason he has a chance to play in the NBA. We had faith in Kevin Boley. We knew he was a good man and a good coach. I’d suggest parents identify a handful of people they trust and once they do follow their lead and let them coach, while you parent. Derrick going to Legend was the pivotal moment in his career. That was our fork in the road, without Kevin Boley and the Legend program there would be no CU or no NBA. We were more focused on the fact he had a scholarship to get his school paid for at a great school with a coach we trusted. We were content with his scholarship to UCCS. What’s funny is he was supposed to redshirt his first year. I told him to get better every day and treat every practice like it was his game. That mentality paid off as Derrick’s redshirt was lifted a week before the first game, because he was dominating everybody in practice. 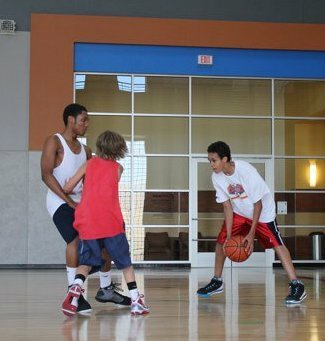 Derrick White, being guarded by Doherty all-state guard Brevin Brimble in 2010, struggled with athleticism in high school. As you can see in the picture he played with straight up and down instead of in athletic positions. I never did. 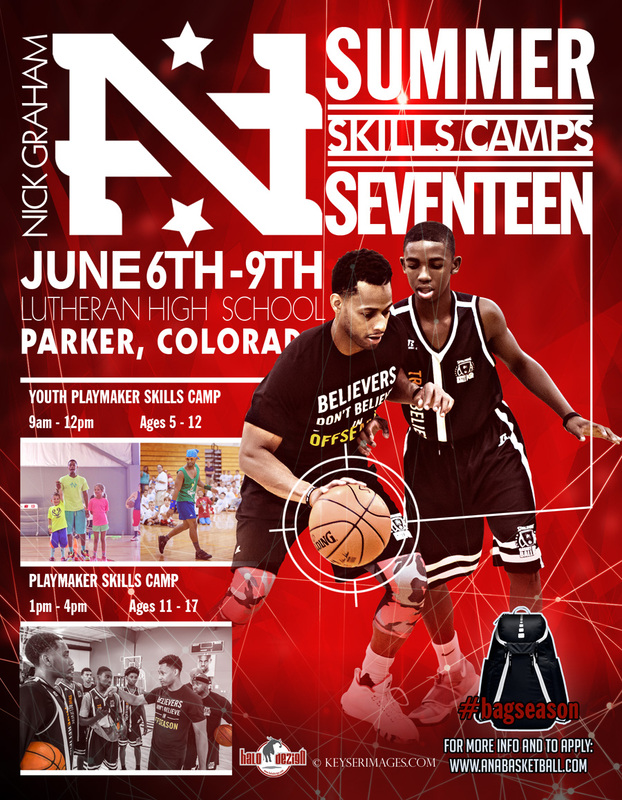 We don’t have expectations; we’ve just always enjoyed the journey from the Parker rec leagues, to Legend, to UCCS, to CU and now the NBA. 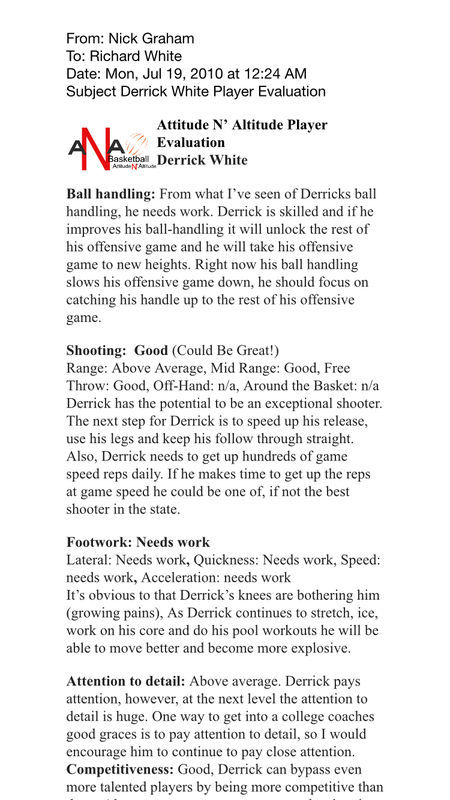 Below is my 2010 evaluation of Derrick. 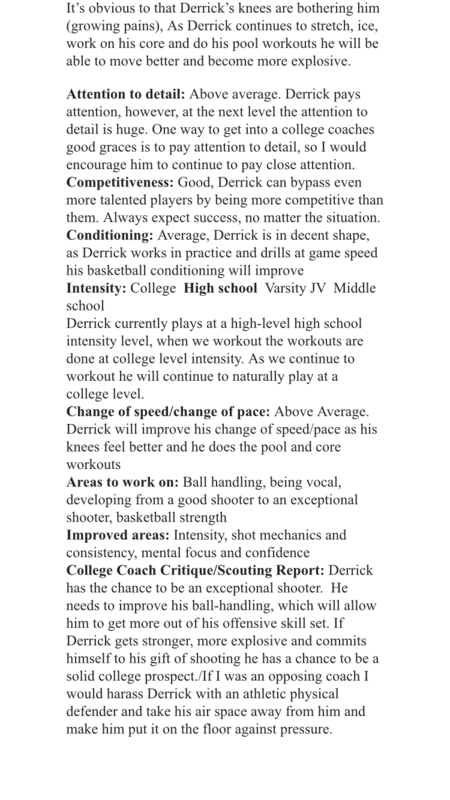 Derrick, his parents and I wanted to share this evaluation in hopes it will lead parents and players to embrace constructive criticism and stay committed to the development process while maintaining hope in their future. As you can see Derrick was far from an NBA prospect at this time, but he stayed committed to developing. 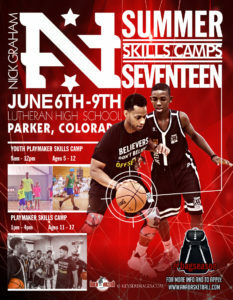 It has been my pleasure to serve the Colorado basketball community through training, being a fan and publisher of this blog. 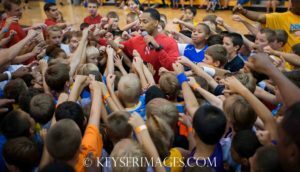 Of all the titles I’ve held the most fulfilling has been to be a big brother to hundreds of Colorado basketball players over the last 10 years. Thank you for embracing and accepting me. It’s now time for me to step away from my roles with Colorado basketball and pursue my lifelong dream of becoming a major college basketball coach. I will forever have a special place in my heart for Colorado basketball and no matter where I go and what I achieve in the future it will never overshadow my time in this community.